Hi, I'm Sarah and I am working at the FSF this summer as part of a newly launched internship program. 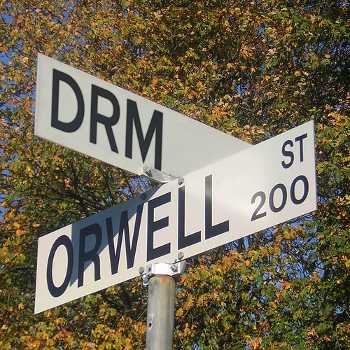 I will be posting new DRM news each Friday. If you'd like to know more about me read my letter of introduction. If you see stories we should mention here, please let me know. Netflix, Why Do You Hate My Operating System?' Periodically, over the past couple of weeks my friend has been coming over to my apartment to watch movies with me. He has a membership to Netflix and I was delighted to learn that Netflix offers streaming of movies at no extra charge with many of its DVD rental plans. The convenience and wide selection of movies made me seriously consider signing up for my own Netflix account. I completely lost any such interest in signing up for an account when I found out Netflix doesn't support my GNU/Linux operating system and promotes proprietary software. The DRM imposed on Netflix makes streaming unable to automatically work with GNU/Linux, unless I download proprietary software applications and even then, it's still not guaranteed to work. Basically, Netflix's DRM restrictions ask me to surrender my control over my laptop (by downloading these proprietary applications) in order to watch movies. Netflix should not even ask me to give up my freedoms in order to use their services. It is now the "new year", a whole seven months since Defective by Design and many Netflix users have politely asked Netflix to remove DRM from it streaming movies. Netflix has ignored its customers' requests to remove this DRM. It has refused to provide support to those who do not run Mac OS X or Windows. Their neglect of customers' requests show that Netflix clearly has no regard for their customers' rights. It's time to think about dropping subscriptions to Netflix. Actually...DRM Isn't Dead By now you've probably seen the headlines “RIAA says DRM is Dead”. Wouldn't it be wonderful if one of DRM's biggest cheerleaders, the RIAA, retracted its support for this restrictive software? Unfortunately, it is too good to be true. Jonathan Lamy, representative of the RIAA, was misquoted by TorrentFreak saying "DRM is dead, isn't it?”, but what Lamy actually said was "There is virtually no DRM on music anymore, at least on download services, including iTunes." While is it true many music providers are now moving toward offering DRM free music downloads, certainly not all of them are. Not only that, but many other products besides music files continue to be restricted by DRM. In the end, whether or not Lamy actually said DRM is dead is irrelevant, we all know that the truth, regrettably, is otherwise. Apple Withdraws Legal Threats from Bluwiki; EFF follows suit In November 2008 Apple legally threatened Bluwiki for a user created wiki page that discusses the possibility, which was unresolved, of how to use software other than Apple software on iPods and iPhones to sync media content. Bluwiki is a wiki that operates without censorship, pop-ups or banner ads. Apple sent a cease and desist e-mail to Bluwiki, claiming the pages violated the DMCA's anti-circumvention provisions and infringed on copyrights they held. Bluwiki responded by taking down the pages and sought legal help. "The EFF and the San Francisco law firm of Keker & Van Nest sued Apple on behalf of OdioWorks, which runs Bluwiki, asking a court to reject Apple's claims and allow Bluwiki to restore the discussions." This month Apple withdrew its legal threats and the EFF withdrew its charges against Apple in response. Apples withdrawal of these allegations are encouraging, but Apple has still left a threatening permeate impression: Not only has Apple infected their devices with DRM, but users can't even discuss alternative bits of software to use without the fear of being sued. Tesco Digital Removes DRM from its Tracks Not only does Tesco Digital offer DRM-free music on in its 15 million tracks, it will allow users to convert tracks they've previously purchased from Tesco Digital from WMA to MP3. This conversion will be offered for free until the end of the month. Update: Palm Pre Will Now Sync With iTunes Last week I wrote about Apple's "bug fix-update" for iTunes on the Palm Pre. This "bug-fix" would essentially no longer allow the user to sync to iTunes from their Palm Pre. This week Palm responded with their own update, and the Pre now syncs with iTunes again. The war between these two proprietary companies continues. Be careful, don't get caught in the crossfire. The Swindle Strikes Again! Amazon's CEO, Jeff Bezos, Apologizes Amazon deleted purchased copies of George Orwell's 1984 and Animal Farm from customer's Kindles. Apparently, these electronic copies were not authorized properly by the publisher, so Amazon simply deleted the copies remotely. Amazon couldn't have chosen more symbolic books to remove could they? This is proof, once again, of the power DRM gives Amazon over your content. Amazon's CEO Jeff Bezos apologized for the remote deletion of the ebooks after criticism began to pour in about the Kindle's use of proprietary software and Digital Restrictions Management (DRM). While we appreciate and welcome his apology, Amazon's ebooks continue to remain encrusted with DRM. As Peter Brown put it, "Unfortunately this matter requires more than just changing internal policy. The real issue here is Amazon's use of DRM and proprietary software. They have unacceptable power over users, and actual respect necessitates more than an apology -- it requires abandoning DRM and releasing the Kindle's software as free software." While this apology is appreciated very much, Amazon still has unacceptable control over the user. If Amazon wishes to take that step to remove DRM from its ebooks, we would be more than happy to help with this transition.